Regan “Grey Boy” Rodrigues leaving court Monday, January 11, 2015. The man charged with the murder of political activist Courtney Crum-Ewing was Monday acquitted of charges of illegal possession of a firearm and ammunition after the prosecution failed to prove its case. City Magistrate, Fabayo Azore dismissed the charges against Regan “Grey Boy” Rodrigues but he was convicted and sentenced to three years imprisonment for escaping from lawful custody. The prosecution’s case was that during a search, with his permission, at his house police for guns, ammunition and narcotics and ammunition, one Taurus pistol and 14 bullets were found under a chair in the house. The court was further told that Rodrigues stated that he was not the holder of a firearm license. The prosecution’s facts were that while Rodrigues was being escorted by police, he shoved down one of the policemen and escaped and later surrendered. The prosecution could not disprove the alibi by Defence Lawyer, Adrian Thompson that Rodrigues was not present at the time of the search. The Magistrate said no evidence was presented by the prosecution to prove that Rodrigues had knowledge of the gun and ammunition under a chair that the police lifted up instead of in his bedroom. 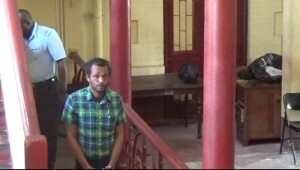 Attorney-at-Law Thompson also told the court that house was occupied by several persons and that Rodrigues was not the owner, convincing the magistrate that anyone could have placed the items under the chair. Rodrigues was charged in July, 2015 with the murder of Crum-Ewing on May 10, 2015 at Diamond, East Bank Demerara. Police said ballistic tests conducted on a handgun confirmed that it was used to gun down Crum-Ewing who had been on a loud-hailer at the time urging residents to go out and vote for the then opposition coalition A Partnership for National Unity+ Alliance For Change. Crum-Ewing was a former officer of the Guyana Defence Force and a past student of Queen’s College.